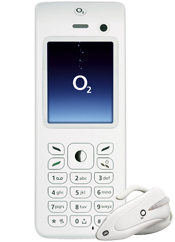 O2 Ice is a tri-band 3G candybar mobile phone that has a elegant design and lovely white in color. O2 Ice handset features as MP3 player, accessing to high speed Internet with 3G, 1.3 megapixel digital camera with zoom, ability for video calling, recording, playback, downloading & streaming via 3G, MP3 ringtones, 260K color LCD screen, supports Java games, supports picture messaging, WAP support, GPRS support, Bluetooth connectivity, and has a MicroSD memory expansion slot. O2 Ice weighs 92g and has the size of 117 x 49 x 14mm. TrustedReviews reviews O2 Ice and concludes with rating of 7 out of 10 that O2 Ice is a very good looking handset. It ignores fancy buttons and bling for a rather understated but consequently appealing design. I have to say I like its whiteness. Feature-wise what you get is decidedly mid range, and O2 let’s the handset down a little by not paying enough attention to detail. Web browsing with fit-to-screen rendering and mini USB connectivity would have been welcome. 3G concludes that the Ice does its job pretty well, though it falls over a little if you start to get too sophisticated. The limitations of the music player and camera might reduce its appeal, for example, and you won’t want to go beyond O2 Active onto the Web very often because the handset doesn’t render Web pages into a ‘fit to screen’ viewing mode. But taken as a mid range 3G handset with PC synchronizing and a sleek and appealing design, O2’s Ice is certainly one cool customer.